"The policy of denial, assimilation and eradication has affected people. Only the Kurds resisted. They still resist." A Turkish parliament member's request Sunday that the legislature apologize to Armenians for the “events of 1915” has caused an uproar in parliament, with members hurling personal insults at one another. Democratic Society Party (DTP) member Osman Euzcelik (Osman Özcelik) brought the matter up during parliament's discussion of the education ministry budget and went on to recall the Armenian massacres by using the Kurdish word that describes Genocide. He also said that he had heard stories about the Armenian killings as child growing up in Turkey and added that the killings were planned by the sultan of the Ottoman Empire and were carried out by groups called Hamiddiye, which also had Kurdish members. Euzcelik likened the campaign to kill Armenians to the current campaign waged against the Kurdistan Workers Party (PKK). “These groups killed a large number of Armenians. A lot of times they would line up the Armenians and shoot them in the chest. All Armenians of Martin were killed and some fled to Syria,” said Euzcelik, who added that his grandfather's family provided refuge for Genocide survivors. Euzcelik said that he was apologizing to Armenians on his own behalf. This comment prompted a member of the AKP to walk toward DTP members and begin screaming at his fellow parliamentarians. Another parliament member intervened to stop what could have become a physical altercation. “Should we not talk about the facts? There is not one Assyrian left,” screamed another DTP member during the commotion, which was followed by several DTP members leaving the parliament. The unprecedented demonstration in Parliament came less one a week after 200 Turkish intellectuals launched an internet petition apologizing to the Armenians for what they called the "injustice" of the "Great Catastrophe" of 1915. The petition, which sparked controversy in Turkey, had garnered over 20,000 signatures by Monday, stirring a media storm on the topic and challenging long-held taboos on the Armenian Genocide. It has drawn the ire of Turkey's ultra nationalists, provoking also Turkey's powerful generals, former diplomats, the Foreign Minister, and the Prime Minister to denounce the campaign. Asbarez also provides a link to a recent ANCA statement on the attempts to confront the Armenian Genocide in the TBMM. President Abdullah Gül filed a mental anguish lawsuit against Canan Arıtman, Izmir deputy for the People’s Republican Party (CHP), in the amount of 1 YTL (about 0.5 euro). CHP deputy Arıtman had implied that President Gül’s mother was Armenian, when the President had made the comment about the campaign to apologize to the Armenians that ability to discuss every opinion is the policy of the state. President Gül claims that his identity as a statesman, which he has been trying to maintain with utmost responsibility and meticulousness, was defamed. Oh, right. As if the worst thing that could be said about anyone is, "Your momma's an Armenian"? Well, this is the AKP, the party of "Love it or leave it! ", the party that has done more than any other to encourage the normalization of racism in Turkish society. Naturally, I could say something about Gül's mom that would cause him considerably more "mental anguish" and it wouldn't have anything to do with her being an Armenian. Sebahat Tuncel is a prominent Turkish Kurdish human rights activist, member of parliament and foreign affairs representative for the Democratic Society Party (DTP), one of Turkey's largest and most important leftist and pro-Kurdish formations. On the streets of Diyarbakır - the center of the Kurdish movement in Turkey - she's known as an especially tenacious and courageous advocate for freedom and human rights. Although she calls for a peaceful, negotiated solution to the Kurdish issue within Turkey's existing borders, the Turkish state is evidently intimidated by Tuncel. 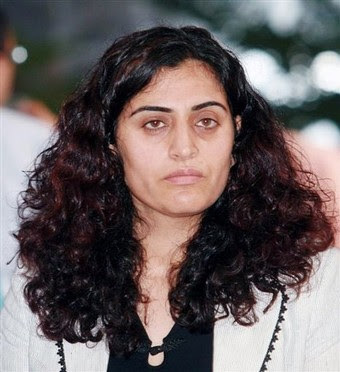 Young and articulate, she was elected to parliament from a prison cell in July 2007 - having been incarcerated for supporting the armed Kurdistan Workers' Party (PKK), a charge commonly used to suppress dissent in Turkey - and has been targeted for assassination by the Ergenekon organization, a shadowy paramilitary group with links to the Turkish military. Although she was released from prison upon being elected, the proceedings against her continue. The Turkish constitutional court is currently considering shutting down the DTP on the basis of its alleged connections to ‘terrorism' and ‘separatism.' You can DTP's proposed solution to the Kurdish question here. The following interview, which took place in November 2008, focuses on the DTP's struggle for a peaceful and democratic solution to the Kurdish issue in Turkey. In it, Tuncel critiques the ruling Justice and Development Party (AKP), discusses recent events in the region, the rise of what she calls ‘fascism' in Turkey, and the many challenges facing the DTP, including the closure case. It's presented here in the interest of increasing international public awareness of the DTP, which is usually marginalized in Western commentary on Turkish affairs. The DTP has been in parliament working for a democratic solution for more than a year now. Reflect on the experience so far. What do you consider to be the party's greatest achievement? Are you more or less optimistic now than you were in July 2007 [when the last elections took place] that the Kurdish issue can be settled in a peaceful, negotiated way? Before the elections of 2007, the atmosphere was more relaxed and optimistic in terms of a solution to the Kurdish problem than it is now. The AKP and Erdoğan were claiming that the Kurdish problem was their problem, that they would take some steps toward a peaceful solution to the issue. As you know, the AKP was challenging the military over the headscarf issue, and because of this challenge, people were thinking that it would be the first government to try to challenge the military's role in politics. Because of this, the AKP was powerful all around Turkey, including in the Kurdish region. But when the AKP announced its sixteenth government program, it became obvious that they wouldn't be confronting the military over the Kurdish issue. Seventy-five Kurdish AKP deputies were elected in July 2007, and they created the impression that after the DTP came to the parliament the two parties could work together to solve the Kurdish problem. But then, afterwards, as I said before, they announced the government program, and in this program they supported the war against the PKK in northern Iraq. The first thing they said to the DTP was, ‘you should first call the PKK a terrorist organization, and then we can sit at the table and talk about this issue.' And then they authorized cross-border operations in northern Iraq. As a result, they showed that they're a party of war. The AKP has surrendered to the military more than any other Turkish government. There was a bargain over the headscarf issue. Since AKP wasn't closed down, they decided to go along with the military politically, and during this period AKP became the first party to ask the general commander of the Turkish army to parliament and talk with a ministerial council. This means that the military is managing and administering the [government's approach to the Kurdish issue] and giving orders to the ministries. While the AKP and Erdoğan are saying that the biggest problem in Turkey in terrorism and telling Europe and the US that he supports democracy and freedom, the AKP is actually the one that is terrorizing people in the Kurdish region of Turkey. They have given greater authority and leeway to the security forces, to ‘resolve' this issue through terrorizing people. In light of recent developments we can say that the AKP government is really the government of war. In his recent [November 2008] visit to the US, Mr. Erdoğan stated that ‘I am proud of my people' - meaning nationalist demonstrators who go into the streets, meaning those people who were throwing stones at DTP buildings and harassing Kurdish artists or attempting to lynch Kurdish students at schools. And this political chaos is still going on. For instance, in his recent speech in Hakkari, Mr. Erdoğan said ‘love Turkey or leave it. The concept of one state, one nation and one flag is essential for us, if you accept it accept it. If not, you must leave.' This simple statement shows how fascistic the AKP is in its core. In his latest statement - saying that [normal people] can ‘defend' themselves and use weapons [against demonstrators] -- could bring Turks and Kurds against each other, and that would be the result of AKP policies. All this unrest was caused by the mistreatment of Mr. Ocalan, who is held [in solitary confinement] in a high-security prison on Imralı island. He has been tortured, confined to progressively smaller cells, his head was shaved and there was an incident with poisoning. Three and a half million Kurds who live in Turkey have said that Mr. Ocalan is their political representative. The maltreatment of the people's representative resulted in such an organized reaction by Kurds. The mistreatment of Ocalan was a provocation of the AKP government. Now, violence is everywhere, organized by everybody. We now know that one-hundred children were arrested in the first few days after the November 1-2 sit-down protest in Diyarbakır. The police are treating Kurds violently not only in the streets, but in the prisons as well. Right now Kurdish political prisoners are being attacked by ordinary prisoners in the prison - the guards see this going on but they don't prevent it. Another face of the violence is the violence against the DTP, such as the closure trial and the attempts to marginalize us politically. All this shows that fascism is rising in Turkey. A few years ago, it was only ultra-nationalist people who were saying that you should either ‘love or leave' your country. But now, if you look at Turkey in general, you can see that most people are saying that. So, in the public, there's a general tendency to isolate Kurdish people and rally people under the idea of a unitary Turkish state, without recognizing other cultural identities. The DTP and PKK have both called for a peaceful, democratic solution to the Kurdish issue within Turkey's existing borders. Why has the state refused to negotiate with the DTP? Who benefits from the continuation of the conflict? The PKK is not insisting on the continuation of this war. They've announced ceasefires five times. The last time they did so was when the DTP asked them to do so. However, these efforts were not welcomed by the state, and the reason they don't want to solve the issue is the state's interests in the Middle East. They have interests in Iraq and its petroleum resources, and they want to have a pretext for intervening there. The continuation of the war with the PKK provides the state with such a pretext. The problem of PKK ‘terrorism' wins Turkey sympathy in the international arena, as well. It helps Ankara resist pressure to expand freedoms, democratization and recognition of human rights. The PKK is saying that it is prepared to accept a solution within Turkey's borders, that Kurds and Turks can live together. The war could end easily, according to the PKK, if its efforts at negotiation were recognized. But since there are still some interest groups who want the war to continue, the war is continuing. So, paradoxically, it could be easy to end the war, but at the same time it is not easy. Do you think the DTP is going to be closed? What are you going to do if it is? The outcome of the closure trial will be a political decision, not a legal one. In the current environment it seems likely that we will be shut down. But a significant group of people are against the closure, so we'll see what happens. We're prepared for the closure; we have a replacement party established already. After the last election, Mr. Erdoğan said that 55% of people in Diyarbakır supported him. But when he came here a few weeks ago, people shut down their shops. People are changing their minds. During the 1990s, scores of politicians connected to pro-Kurdish parties were murdered, tortured, and harassed in every way. What kind of conditions do you work under now? Is the DTP able to go about its business in a normal way? Do you feel safe? In terms of human rights violence and torture even normal people in the street do not feel safe from violence, it's common everywhere in Turkey. You can be shot and killed at any moment. As you can see on the news, Ahmet Ozcan, a youngster at the age of 20 was shot and killed by the police during a recent demonstration in Ağrı; also, in Antalya a boy named Çağdaş traveling on his motorcycle was shot by the police. Violence and threats against Kurdish politicians and parties are still common. Because the DTP is equalized with terrorism and because of the rise of fascism, there is always a risk that we'll be assassinated. Even though there are risks, we are not giving up. We know that there are risks, and we're always threatened with e-mails and trials. The DTP is mission is a democratic and peaceful solution of the Kurdish question and it has always stood by the Kurdish people and struggled for the rights of the Kurds. Whatever the consequences may be - death, re -imprisonment - it is our mission to achieve these goals. For every word we utter they open a new case against us. Although under law an MP cannot normally be tried, there are cases against us still going on. Although there are those risks we believe in peace, freedom and democracy and we will not give up on our struggle. We are stronger than these threats, and we will struggle for freedom, for democracy and for peace. I don't feel safe. It has been revealed that the Ergenekon organization was targeting [DTP co-chairperson and MP] Ahmet Turk, [DTP member and Mayor of Diyarbakır] Osman Baydemir and myself for assassination. 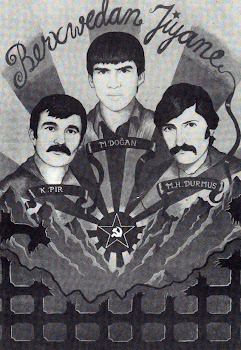 At any moment, someone from Ergenekon could come and kill. Last time we spoke you told me the DTP was trying to open a political bureau in Washington. What's the status of that project? We're planning on opening the bureau within a few months, but it will depend on the outcome of the closure trial, for sure. Go, Sebahat, you go, girlfriend! If you liked the interview with Heval Sebahat, go on over to ZNet and let Jake know. Absolutely amazing. Words can't describe it.